). No third option is available. Christ’s bodily resurrection is either completely true or false. If it is false, then we have nothing to believe. If it is true, then it is the direct intervention of God in human history for the salvation of mankind and it validates the truthfulness of what the Bible says about the person, nature, and work of Jesus Christ. Our apologetic work begins with His resurrection. At one time the secular media respected the names of God and Jesus Christ. It was common for newspapers in the 19th century and early 20th century to carry sermons of leading preachers in our nation. But those glory days are far gone. The secular world feasts on engaging Christianity in battle from every side. We do not get to pick our battles, but when they publish a false claim, we must either boldly respond or humiliate our heritage with silence. In this respect, today’s Christianity has been engaged in two unwanted battlefronts that obligate us to assume offensive and defensive postures. We know that the real battle is spiritual and that the men whose passion it is to destroy Christianity are unwittingly guided puppets of the Prince of Darkness, and the most peculiar thing about it is that they have no inkling of this. Paul informs us that “the weapons of our warfare are not carnal” (2 Corinthians 10:4). This spiritual contrast is eloquently portrayed in Donald Grey Barnhouse’s book, The Invisible War (1965). The other battle is verbal. We feel compelled to set straight falsified, twisted, and distorted messages about Jesus that deceive the masses. Jesus is an easy target for them to shoot at because the Church does not respond in violence, but rather by apologetics. From the beginning we have defended the truth in word, logic, and faith (Jude 3). It is noticeable that every year, as Easter approaches, the secular world takes their best shot at Jesus and His resurrection. We defend Him and His claims, and rightfully so, but sadly when the smoke clears our hearts hurt for those victimized by the lies of the enemies of Christ. There is a method to the world’s madness. If they can somehow cut down God or Jesus Christ, then their world will be a much better place to live (so they think). Take the example from the Russian Communist revolution. The Bolshevik revolution that followed Lenin supported a trade agreement in 1924 with Canada. When the Bolshevik emissaries arrived in Canada with 40 crates for luggage, the Canadian Customs grew suspicious and demanded an inspection against their diplomatic protest. The Canadian search found that 40 percent of the content was propaganda destined for distribution, “denouncing and ridiculing Jesus Christ and the Christian religion and praising Communism and revolution.”  . Since Christianity withstands error, they must first attack us to later promote their cause. It is no secret to those who study Israel’s archaeology that many first century tombs have been discovered with the bone receptacles, called ossuaries, still intact. Archaeology, as a scholarly study, does not thrive on flamboyance to stake its claim. Its history is marked with ethics and professional standards that few dare cross. Departing from these standards is the Discovery Channel’s film The Lost Tomb of Jesus (James Cameron, producer, Simcha Jacobovici, director). It turns a serious study into a carnival sideshow with extremist viewpoints and speculation that most scholars detest. 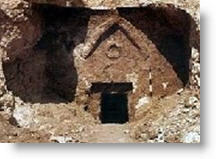 Cameron and Jacobovici’s earth-shaking news is that the family tomb of Jesus was discovered (pictured at left). Their idea is based upon the ossuary inscription names of Joseph, Mary, “Jesus son of Joseph,” Mary Magdalene, and “Judah son of Jesus.” They also reason that if Jesus’ bones were in an ossuary, then he did not raise from the dead. But missing from this equation is the fact that nearly 100 ossuaries in Israel bear the names Jesus, Joseph, and Mary, so granting their hypothesis, how can they assure their followers that they have the correct ossuaries? They cannot and they leave that unaddressed. We know this is Jesus’ tomb, because the right ossuary names are grouped. What tells you that you have the “right” group? We did DNA testing and found out that they are unrelated. How does this prove it’s Jesus of Nazareth? Because we have the right group of names on the ossuaries. Actually, the opposite is true. Christians believe in truth and, therefore, we use scientific studies without fear. The problem here is not science, but its misuse by these theorists. Cameron’s statement also contradicts the New Testament (think of Thomas who demanded hard evidence and, again, Jesus who offered such in Luke 24:39) and Church history overflows with evidence instead of blind faith. Here he commits yet another logical fallacy. He equivocates his term “evidence.” He uses it first in the historical sense and second in the scientific sense without distinction. Historical evidence is not tested scientifically as in a laboratory. How would Cameron propose to “scientifically” prove or disprove the historical evidence that Washington crossed the Delaware River? Cameron ‘s logic and premises are fatally flawed. The Website front page outright lies: “Tombs (sic) with the names The Virgin Mary, Jesus of Nazareth, Mary Magdalene and Judah, their son, are found….” Their lie is that Virgin, Nazareth, and “their son,” appear nowhere on the tomb or its ossuaries. It is deceptive for Cameron and Jacobovici to pretend that their hypothesis is new when BBC produced a similar documentary in 1996 and newspapers reported the story. There is no evidence that Jesus was ever called the “son of Joseph,” which they should first prove before seeking ossuaries with it. Point: wrong ID equals wrong person. Their DNA test is flawed. Why test only two ossuaries with the names Mary and Jesus when 64 are available? First century Romans and Jews had the best opportunity to produce Jesus’ bones, but they could not do so and they knew with certainty the tomb’s location! The name-game with Mary Magdalene is flawed. You do not use a document written in AD 350 to identify a name three centuries earlier. Archaeologist Joe Zias, who cataloged the ossuaries, devastated the family tomb theory on March 1, 2007 by showing that the tomb’s 10th ossuary is blank, not inscribed, so it is not Jesus’ brother, James! smoking-gun-tenth-talpiot-ossuary_9874.html Now it appears that their thesis has a missing family member. To excerpt for articles, credit Kurt Van Gorden, Jude 3 Missions Newsletter, February/March 2007, 1-2.